We have expanded our review of Neil Lehto's fine historical novel, Algonquin Elegy: Tom Thomson's Last Spring (Universe Inc: New York, 2005), which gave us even more insight into two characters of Northwest history who have almost slipped through the cracks. We started researching Alice Elinor Lambert — a writer who lived for several decades in Darrington, Snohomish County — a few years ago because we discovered that she both knew very well several descendants of Northwest pioneers and because she wrote unpublished manuscripts about them and important events and groups. We soon discovered her teenage romance (at the turn of the 20th Century) with Tom Thomson who is generally recognized as Canada's most accomplished landscape artist. We have corresponded with Neil extensively and he has provided unique insight into how he learned details about the lives of both of these people and how he fleshed them out after in-depth research. He created a fictional character named Jon Kristian, a lawyer who decides to visit Canoe Lake in the Algonquin Park in Ontario province, Canada. Kristian is going through a divorce as he steps outside his former life to study the mysterious death of Thomson that resulted from his departure on a mysterious canoe trip on the lake on July 8, 1917. A few days later, the canoe was found capsized, with no sign of Thomson. Even though Algonquin Elegy is a partly fictional rendering of the story, the book also includes researched historical details and thus may be the most important look at the controversy so far. Like many other writers, Neil was intrigued by the differing conclusions and suppositions in several books published in the intervening decades. Some authors hint at murder and others pose questionable conclusions such as that Tompson died merely by accident during drunkenness. Like a few others, Neil soon discovered that Thomson was an expert at traversing the wilderness, having served as a fire ranger and a park ranger in various Ontario locations for four years after resigning from his last position at a commercial art agency, his day job from 1905-13. Neil's research into those last four years of Tom's life are vital, for any reader curious about his death, because Neil provides details about Tom's twin-track life as both blooming artist and outdoorsman and fisherman. Those experiences added depth and texture to Tom's drawings and paintings. He first dove into the lake environment after serving as best man for a friend's wedding in 1910 at Fairy Lake, where he made "a few seminal sketches." Two years later, he and another artist friend, H.B. "Ben" Jackson paddled and portaged through several lakes and land in between, including Canoe Lake. On another trip, Tom learned the danger of freshwater voyages when his canoe was upset in the whitewater rapids on the Audinandong River. Not only did he get a good dunking, but he lost his sketches, to boot. Dr. James M. MacCullum, an ophthalmologist in Toronto and a patron of the arts, began investing in Tom's work soon after that so Tom's departure from commercial art proved to be a wise move, as did his immersion in nature. Lehto's exploration of Thomson the artist and the outdoorsman will fascinate anyone who admires Thomson's work and has been curious about his death, but the book also spends more time on Thomson's relationship with Alice Elinor Lambert than any Thomson biographer has in the past. He includes two chapters about Alice, one covering the bare bones of their relationship and the other an imagined encounter between the two, with speculation about their brief affair and what it meant to Thomson's life while he lived in Seattle for about four years before returning to his home area of Leith, Ontario. We refer you back to our main story on Lambert and Thomson for many of the details of that time right after the turn of the 20th century, but meanwhile, we quote part of Neil's explanation of what he discovered about the star-crossed lovers. Alice Elinor Lambert's Role in Tom Thomson's Story Blodwen Davies personally hand-set and printed her book, A Study of Tom Thomson, in 1935. Perhaps, that explains why the book lacks footnotes, references and bibliography. The highly-prized copy I bought at http://www.alibris.com for $252.00 in November 2003 is No. 62 of a special edition of 100 bound by hand and signed by Ms. Davies. In a Chapter III called "The Boy" she tells what she learned from Thomson's family and friends about the three years he spent in Seattle, Washington from 1901 to 1904. Ms. Davies never names any of them and offers no clue whatsoever for the source of the brief mention she makes of Tom's first girlfriend, who later biographers would learn was Alice Elinor Lambert. "One more event occurred that completed the cycle of experiences that Seattle had in store for him. He fell in love. Friends and relatives knew next to nothing of the significance of that brief and tragic romance," she wrote. "Thomson was endowed with a depth of feeling that would have been incomprehensible to the inexperienced young woman he would meet in a west town coast thirty-odd ago (sic). Nobody knows exactly what happened. Some say the lady laughed." When I first read this brief description, I was especially puzzled to understand why Ms. Davies had concluded that, despite the fact that his friends and relatives knew enough to "say the lady laughed", they "knew next to nothing of the significance of that brief and tragic romance." Was that her awkward way of saying that she recognized what they failed to appreciate? A paragraph later, Ms. Davies answered my question. "This shadowy love affair was a very important event. Of the quality of the woman's love we know nothing, but the significant thing was Thomson's love for her. It was the sort of experience that might have turned him into an embittered man, if his love had been selfish and possessive." In a following paragraph, Ms. Davies ends a particularly ethereal discussion of "love as a cosmic force often used as a means of personal gratification rather than as intended for the evolution of man into a creative being" by concluding, "Because of the results in Thomson's life, we know the quality of his love. He did not waste its force by blaming the woman but to set to work to alter the currents of his life." Today's essay, 89 years after Tom Thomson drowned in Algonquin Park's Canoe Lake on July 8, 1917, asks and tries to answer what significance this 1904 romance had for Tom Thomson, age 27, and Alice Elinor Lambert, age 18. Much of what is known today comes from the extensive research of Joan Murray, author of numerous books about the painting and life of Tom Thomson. Born in New York, in 1943, Ms. Murray studied art history at the University of Toronto, receiving an Honours B.A. (1965). After earning her M.A. at Columbia University (1966), she returned to University of Toronto for her doctorate. From 1970 to 1973, she worked as the first Curator of Canadian Art at the Art Gallery of Ontario. From 1974 to 1999, Ms. Murray directed the Robert McLaughlin Gallery in Oshawa. Since then, she has organized more than 100 exhibitions and written many books on Canadian art. For the last several years, she served as interim executive director and chief executive officer of the McMichael Canadian Art Collection in Kleinburg, Ontario. While waiting page proofs of Algonquin Elegy, I found a website, which re-published an article about Alice Elinor Lambert from the Skagit River Journal of History and Folklore, written and edited by Noel V. Bourasaw called and "Alice Elinor Lambert and Elizabeth Poehlman and their quest for history and a special guest — painter Tom Thomson." I had learned much researching Lambert family history. Adding to my understanding was additional genealogical work on the family of Pitt Pill and Mabel A. Shaw. I knew that Tom's younger brother, Ralph, and a Thomson friend, Horace Rutherford, boarded together at the home of Mr. and Mrs. Shaw in Seattle, where 18-year-old Alice had come from Portland to stay on weekends over the summer of 1904 while she work as a saleslady in a millenary shop owned by her aunt's family. I also knew that Horace had been fingered as a suitor of marriage to Alice that may have ruptured Tom romance with her. I knew that she would finish high school in Seattle the following year. Finally, I'd read her romance novel, Women Are Like That, which was published by Dell in 1934. Some earlier biographers said Tom, too, was boarding with Mr. and Mrs. Shaw, when Alice arrived from Portland. Others said he stayed at the home of Charles C. Maring, a friend of his older brother, George Thomson. Joan Murray reported that Tom and Horace Rutherford returned to Owen Sound in 1904. U.S. Census records verified that Ralph Thomson married Ruth Shaw, older daughter of Mr. and Mrs. Shaw, in 1906. In November 1971, when Alice was 85-years-old, she corresponded with Joan Murray, telling a brief tale of her romance with Tom Thomson. Little of what Alice wrote is possible to verify. "I recall him standing by the piano, while Mrs. Shaw . . . played . . . . One of his favorites was In the Shade of the Sheltering Palm. He would stand there tall and dark and slender, singing in his clear tenor, and the other boarders, the family and I would sit around and beg him to sing." Neil goes on in this excerpt from his website to give details of how he conducted extensive research into the social mores and folkways of the period along with newspapers, music, poetry and books, all of which gave him material to flesh out the characters in his book. For those who have read other accounts of Tompson's mysterious death, they will certainly appreciate Neil's delineation of many of the key books and unpublished manuscripts. His comparison of the prior published theories and his notations about the contradictions between them was fascinating to a person like me who tries to sort out all the conflicting information and charges. I also appreciated that, while he certainly asserts his own point of view in the long-running argument about murder/suicide/accident, he leaves the ultimate decision to the reader. 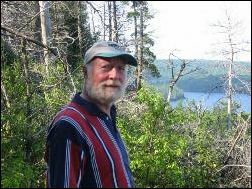 Neil first visited Ontario's Algonquin Provincial Park in 1976. On that first five-day canoe trip, he was introduced to the true story of Canadian landscape painter, Tom Thomson, who drowned on July 8, 1917, in the Park's Canoe Lake. Visiting the Park almost every summer for a week to 10 days, with side trips to Owen Sound, Toronto, Kleinberg, South River, and Ottawa, Neil toured all of the Ontario museums with paintings by Thomson and he collected most of the Thomson art books and earlier biographies. Over the last 30 years, he has taken several whitewater canoe courses and tandem paddled many sections of the Oxtongue, Ottawa, Magnetawan and Madawaska Rivers in the Algonquin area. He began the writing of Algonquin Elegy: Tom Thomson's Last Spring, in 1994, completing several character sketches for an on-line writing class, starting with a character he then called Northway Jon O'Connor, described as returning to Algonquin Park to investigate the drowning of Tom Thomson following a bitter divorce. Northway Jon O'Connor became Jon Kristian in the final writing of the book. Most of the other fictional characters, Howard Hancock, Dixie Waterford and Lucky Haskins, emerged from these writing exercises. Here's an interesting little-known fact — their names come from freeway exit signs along I-75 and I-69, which Neil passed while traveling to conferences and meetings with municipal clients in Michigan, Ohio and Indiana. In chapters of the book called "Kristian's Notebook," Lehto tells the carefully researched Tom Thomson's story. He gathered particularly important insights from a visit to the Trent University in Petersbourough, Ontario, to personally inspect Algonquin Park Ranger Mark Robinson's 1917 daily journal with permission from the family of his daughter, Ottelyn Addison. He obtained copies of telegrams and letters relating to Tom Thomson from files of Dr. James MacCallum, M.D., bequeathed to the National Gallery of Canada and others from the files of the Owen Sound Public Library. Neil received invaluable advice and assistance from Thomson experts, Joan Murray, former chief executive officer of the McMichael Canadian Art Collection, and Roy MacGregor, national columnist for the Globe & Mail. He corresponded with many others, including Dr. Phil Hall, M.D., professor of obstetrics/gynecology at the University of Manitoba in Winnipeg. Now, if only descendants of the people who knew Alice and Tom in Seattle would just come forward, Neil and I would be overjoyed. I would especially like to know if Tom's subsequent art was influenced by travels throughout the North Cascades mountains and the many lakes of Washington state.